The Dash: Social Media Isn't Dying. But It Needs To Grow Up Faster. Scott Monty's resignation on May 19th as head of Ford's social media team sparked a useful reflection on the state of the social media industry. For starters, you should read his blog. It's a classy way to say goodbye. His resignation has prompted a trio of thoughtful posts by some of social's greatest thinkers. These are all must reads for anyone who touches digital in an organization or has a "C" in front of their title. In Social Media Today, Frank Eliason traces the evolution of social media within organizations, and laments what it has meant for quality. In Forbes, Shel Israel catalogues the mostly goings of social's early corporate pioneers. To Shel, Scott's departure from Ford is merely the last in a wagon train of folks who believed that social could revolutionize how companies talk to their consumers but who have now moved on to other roles. In Shel's view, "social media strategists are the beautiful babies being washed down the drains of companies who have otherwise fouled their bath water." Finally, my friend Richard Binhammer calls on business to completely rethink how they are organized and what their social efforts can achieve. And in a post-Ford interview in AdWeek, Scott himself voiced his concerns about the future of social within a marketing organization. So is social media dying? No, it's just experiencing some of the awkward growing pains of being a teenager. But it does need to grow up faster. You need great content: As anyone who has followed my work at Coca-Cola knows, I am a staunch believer that great, shareable, impactful content needs to be at the core of any digital strategy. If a consumer gives you five minutes (or, even better, ten minutes) of their time, they need to get something back. Whether you make them laugh, make them say "aww", give them a great recipe for the holidays, or a fun summer party idea, your content has to be good and it has to be useful. One of the smartest people I know, Jonathan Mildenhall, who was just tapped to be the next CMO of Airbnb, once gave my team a deep dive on creating this type of content. The title: #workthatmatters. Focus on all of your audiences: Over the last four years, I spent time with social media leaders at most big brands in America. The lion's share of planning and attention goes to reaching mass audiences of consumers. But if you go one click down, there are reporters who cover your business, investors, job seekers, influential core target groups and many, many more. All of these folks can be reached and influenced through social outreach. At Coke, for example, we found that LinkedIn is a powerful channel for reaching opinion leaders and investors with long-form content. We use Twitter extensively to manage conversations with journalists. The best social strategies think about how all of your audiences use social media. Use data wisely: Today in my Facebook feed I've been pitched ads for hair care products, politicians in Maine (where I don't live), a start up called Single Grain (this one is a real puzzler), and a promoted article on the impending U.S. whiskey shortage (which was spot on targeting; I read it immediately). Social media is ushering in a golden age where brands can put great content with the right message in front of exactly the right person at the right time. This is unprecedented in marketing history, and should make the user experience better. But only if data and targeting are used wisely. At Coke, we constantly look at performance data to optimize our social plans to create content we know audiences want to see. Is it perfect? No, but it's getting better all the time. And as a bonus, our organic reach numbers are still significantly higher than has been reported in the media. This is because even with algorithm changes, your content - if it's good enough - will still reach a large number of people. Richard Binhammer is right when he says that huge organizational shifts are coming. Many organizations are not equipped to fully leverage social media's full potential. This includes legacy corporate structures that don't allow for the cross-functional nature of social media, the muscle to move fast (to capitalize quickly on social innovation), a commitment to always be transparent (this LinkedIn post by Target's Jeff Jones is an example of transparency done well), sophisticated social analytics capability, and a lack of a digital-first culture. I don't think marketing's interest in social media is a sign that social is on the ropes. When more people across the organization take an interest in something, and bring creativity, cash, and enthusiasm to the table, that's a good thing. This is a logical maturation path for social in the enterprise. Now is the time for social media strategists to rise up and take their rightful place at the CMO's table. 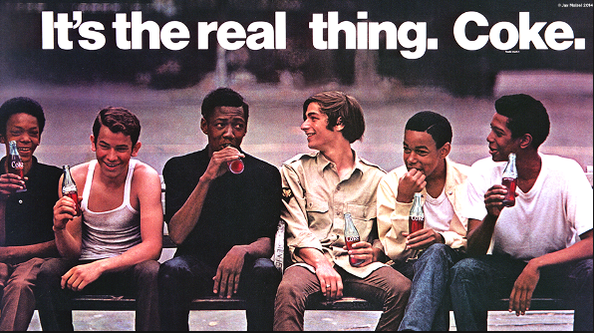 UPDATE: For more information on 'Boys on a Bench' and #WorkThatMatters, check out Jonathan Mildenhall's great blog post on Coca-Cola Journey here. I love the Come example and cite it often. They are so far ahead of the curve compared to most brands. Does the Coca Cola website allow for meaningful dialogue about how peer-reviewed research links "diet" soda with diabetes, heart disease and obesity? Or that Coca Cola sweetens its other drinks with high fructose corn syrup, which research also links to negative health consequences? In my circles of friends, this is all I hear about when we're talking about soft drinks. This is the real "social conversation." Please be real: social media marketers are in the business of selling products and swaying public opinion, just like any other flack in the business. TJ, those issues aren't the subject of my post and I am not an expert on health issues. I suggest you go to the Journey website and ask them there. Or reach to Coke via social media. My point is that all this high-falutin' talk about "authenticity" and "transparency" is, well, inauthentic. Social media marketing is about selling. The sharing is superficial, not deep, and it's designed to sell products and burnish the brand, not to encourage any sort of meaningful dialogue. I can accept the fact that marketing is manipulative. That's just the way it is. I'm just saying that we shouldn't pretend it's anything else. The term "social media marketing" itself is a misnomer. We're talking about digital marketing that selectively leverages user-generated content to promote the brand and generate sales. "Social" to me means hanging out with friends and being real. It does not mean having a conversation with or being pitched a product by a sales representative, regardless of how polite and well-meaning the sales rep. happens to be. I think part of the evolution of social media marketing, or whatever you want to call it, is that people are beginning to acknowledge the reality that you can't be a genuine friend and a salesman at the same time, and let's not pretend otherwise. This is where I disagree. In just the last week I have been tremendously helped by @DeltaAssist, @LinkedInHelp, and @ComcastCares. And what social media practitioners are working to create is a world where brands are not only trusted, but are your partners. If that brings you closer to the brand and encourages you to consider it the next time you buy, that's great and part of the intent. I don't think any brand is trying to pretend they aren't trying to sell products. But social is allowing brands to be better at meeting your needs. If you want health information from Coke, you need to ask. That data might inform a decision at Coke to provide richer information on the topic. Ask COKE for health information? You must be kidding! There has been numerous peer-reviewed, unbiased research on the links between diet soda and myriad negative health effects. This news has been covered by USA Today, 60 Minutes and other highly visible mainstream media outlets. Coke is well aware of these studies, I'm sure. They need know help from me in that department. Interesting Comment. BUT I do hope things are not as bad as you describe them. Engagement can be authentic, but then one has to reply to comments and engage. Social Media was not intended to be used to sell. Okay, building brand surely is social media marketing if it uses the company blog, etc. But we need to measure this properly .... Maybe we need a Social Media Audit to see how we are doing? And while a salesperson does not need to be my friend, if her product does not help in solving my problem or satisfying me need, she is in the wrong business. Here are some thoughts I shared on a private Facebook group recently - related to many of the blog posts you mention, along with a few added notes. 1. The amount of investment from brands into social (for resources, technology, advertising, etc.) alone is a sign that social is working for brands. Brands are not experimenting anymore; they are expecting results. Shel Israel wrote a nice article and a well-deserved homage to Ford's social pioneer Scott Monty, but I respectfully disagree with the analysis and conclusion along the way - based on facts and my personal experience working with Fortune 500s. Social is very much alive in the enterprise even though it's become increasingly complex to manage because of the risks and opportunities that social raises. 2. The problems of crappy social marketing and the issues of consumer perception (i.e. "brands are infiltrating social networks!") have been around for almost a decade, but they are not as often found in large brands as in the past. 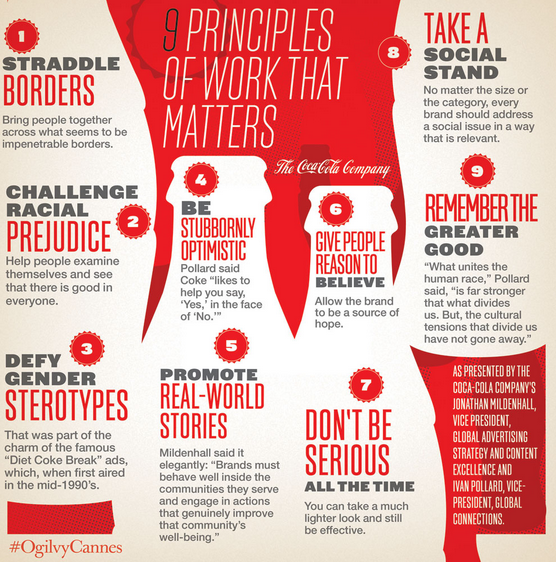 NOTE: Coca-Cola has done a wonderful job with all of its marketing and community efforts; great brand + content + digital properties (i.e. The Coca-Cola Journey). 3. While some brands have benefitted from having a person or group of people publicly championing a brand, this is not something that can be scaled very much and it is not something that can last more than 3-5 years (people change jobs). More importantly, it is a model that can no longer be instituted because social is now a formal element of every digital organization across marketing + customer service + PR + Sales + etc. 4. There are many more brands that have never had a single leader championing the cause. Jeremiah Owyang's hub-and-spoke and multiple-hub-and-spoke org models have probably been proudly passed around within company floors by the vast majority of brands that did not or could not take Ford's centralized approach. 5. There are so many brands with fantastic behind-the-scenes team members we will never hear much about - for more reasons than one. A look at the apparel industry is enough: Nike, Levi's, lululemon, Victoria Secret and GAP are just a few brands making great use of social to connect with breathing, thinking, feeling human fans that love the stuff they make, AND to also leverage social for mass communications. The fact is mass brands *should* be reaching mass audiences, and social allows for that in a targeted/retargeted/remarketer manner that is unprecedented. Relevant content is key. 6. Brands are not abandoning conversations - in fact, they are having more conversations than ever. But marketing and customer service and PR are not about conversations with consumers, that's only an aspect of it. Some consumers want to be left alone, and others just want their problems solved. Conversations should not be the goal just like engagement for the sake of engagement is useless. Ultimately, it's about consistently executing on a very good strategy - and that's much easier said than done, especially in a space that changes so quickly. This is one of the best blog posts that I have read in a along time! I am sharing this with everyone at our agency! I tried to explain may concerns in a blog entry, including data, charts and numbers - and yes I linked to your comment Esteban.